Definitive proof that the best things do (sometimes) come in smaller packages, Huda Beauty’s Precious Stones Obsessions Palettes are here – and they’re absolutely exquisite! A dream come true for those Huda-holics who can’t squeeze their palettes into overstretched make up bags (or those yet to sample her game-changing shadows) this Emerald Obsessions Palette unites a spectrum of nine pigment-packed powders – six vibrant duo-chrome shimmers and three creamy mattes – in shades ranging from mint or golden olive to timeless emerald and show-stopping peacock green. Love your Huda palette but can’t fit it in your make up bag? Or just desperate to sample the shadows that have sent the beauty world into a spin? 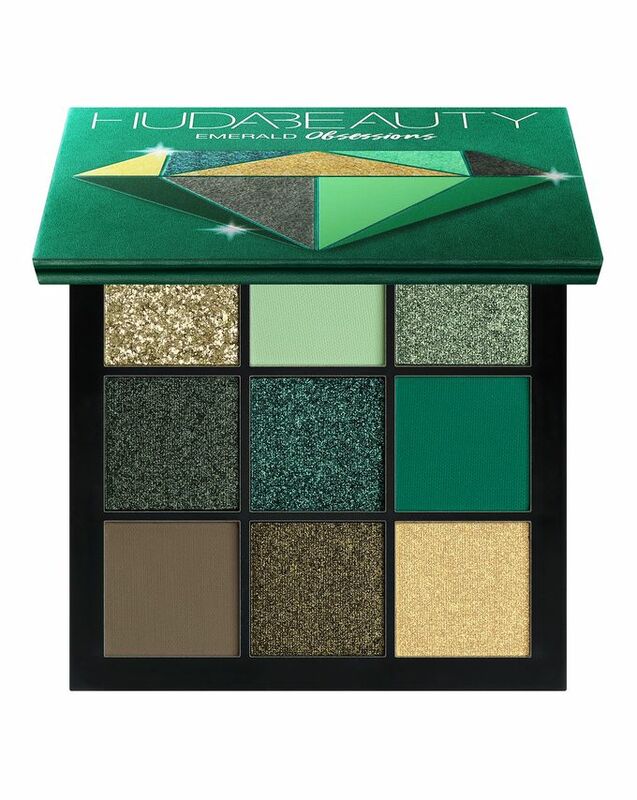 The answer is Huda Beauty’s Emerald Obsessions Palette, a slimline edit of the most sought-after, green-hued shadows and all you need to achieve an array of mesmer-eyes-ing vibrant eye looks. The ultimate capsule make up wardrobe, this unites nine ultra-versatile, buttery smooth shadows – six vibrant duo-chrome shimmers and three creamy mattes. We’re completely besotted with the range of hues and textures and you're guaranteed to fall head-over-heels too – especially with the beautifully versatile range of mint, golden olive, timeless emerald and show-stopping peacock green. Perfectly on-trend, this gemstone-inspired edit is sure to become a precious product in your arsenal. Serious pigmentation. These are also so wearable and gorgeous. The palette is amazing, it blends like butter and the colours are stunning, buy it, it's a must have. Still not quite the ‘pop’ of Anastasia’s palettes, but the difference is negligible. The metallic foils are great, fabulous bold pigments, lovely pallet. Amazing shades. Very pigmented, easy to blend. Beautiful colours - I'm overwhelmed! I USE IT MATCHING TO MY EYES AND WEARING WHATEVER COLOR I WANT. IT'S PERFECT ANYWAYS.....THE PRODUCT ITSELF IS VERY PIGMENTED AND EASY TO BLEND. THE PALETTE CONTAINS ALL OPTIONAL COLORS FOR A PERFECT LOOK IN ONE HAND! That said I find it difficult to work with, I was going to gift one of these to my mom but changed my mind after using it. The colours are absolutely beautiful and for me the best results showed with less blending and more stamping motions. Try to only put the colours where you want them and press them in. If that makes sense. If you are a make-up lover who doesn't mind taking a few extra minutes to get the perfect pay off then these colours are perfect for you. But I wouldn't recommend these for a beginner or a regular consumer as I honestly don't believe these are a quick go to. I hope you found this helpful. I have never seen so beautiful green colors in one palette!!! Definitely a nice addition to my kit. While it is a beautiful palette, quality-wise I don't think is as good as some of the others obsession palettes from Huda. The first metallic shade I personally find to be a little too much sheer and needs to be build up. The green mattes are so so; the green on the last row is nothing like you see on those Instagram photos, it's quite sheer and not particularly bright. Absolutely beautiful palette with good pigmentation and the eyeshadows blend nicely. The problem? They looked awful after a day of work. I work as a secretary too, my work does not cause my makeup to wear out from physical work. There was a hint of eyeshadow left in my eyes, usually UD primer potion keeps eyeshadows in place for me. Anastasia and Makeup Geek is better quality. I probably won't really use this palette anymore unless I want to baby sit it all day. Отличная передача цвета, немного пятнят, но найти к ним подход все отлично. ***Excellent colours and pigment, they can stain a little, but finding the right way to use them this can be avoided. Хорошая палетка. Шиммеры очень интенсивные. Матовые оттенки имеют среднюю пигментацию *** Good palette. Shimmers are very intense. Matt shades have medium pigmentation. I have had an obsession for green shades lately, so I had to have it. I don't regret buying it. Beautiful bold colours that are easy to blend. This was a gift for my son's girlfriend and was well received. She loves the colours! Amazing formula but not the best shades of green for dark brown eyes. This is my first all greens palette, and it's perfect. Never seen so beautiful green colours, so pretty, blend perfectly! I was gifted this tiny palette and I'm really amazed by its colours. I can't really say that the quality of the (matte) eyeshadows can be compared to the bigger palettes (that are made in Italy) because some shades are somehow patchy... those tiny pallets are made in China and cost way less than the bigger ones so I guess this is the point. However, I'm very happy I still own this palette because of its unsual shades! You can make gorgeous looks quickly. Blends and the metallic shades are stunning. A great variety of greens. The only negative is the teal/green shade, I wish it was even more green looking. It tends to lean blue. Overall I would recommend this palette for others who love green eyeshadow, this is a great staple in my collection. All shades in this palette are amazing except for the matte green on the last column, it’s so sheer and has no pigment, but the rest of the shades are incredible!